Dr. Zain Al-Safi is committed to providing excellent patient care and advanced reproductive health services. His clinical interests include infertility, polycystic ovary syndrome, oncofertility, reproductive surgery and menopausal health. "I look forward to assisting you on your journey to achieve pregnancy." Al-Safi ZA, Polotsky A, Chosich J, Roth L, Allshouse AA, Bradford AP, Santoro N. Evidence for Disruption of Normal Circadian Cortisol Rhythm in Women with Obesity. Gynecol Endocrinol. 2017. Epub ahead of print. [PMID: 29068243]. Sundheimer LW, Liu L, Buyalos RP, Hubert G, Al-Safi Z, Shamonki M. Diagnosis of Parental Balanced Reciprocal Translocations by Trophectoderm Biopsy and Comprehensive Chromosomal Screening. J Assist Reprod Genet. 2017. Epub ahead of print. [PMID: 28900794]. Kroener L, Dumesic D, Al-Safi Z. Use of Fertility Medications and Cancer risk: A Review and Update. Curr Opin Obstet Gynecol. 2017 Aug;29(4):195-201. [PMID: 28538003]. Al-Safi ZA, Liu H, Carlson NE, Chosich J, Harris M, Bradford AP, Robledo C, Eckel RH, Polotsky AJ. Omega-3 Fatty Acid Supplementation Lowers Serum FSH in Normal Weight but not Obese Women. J Clin Endocrinol Metab, 2016; 101(1): 324-333. [PMID: 26523525]. Al-Safi ZA, Liu H, Carlson NE, Chosich J, Lesh J, Robledo C, Bradford AP, Gee NA, Phang T, Santoro N, Kohrt W, Polotsky AJ. Estradiol Priming Improves Gonadotrope Sensitivity and Pro-Inflammatory Cytokines in Obese Women. J Clin Endocrinol Metab, 2015; 100(11): 4372-81 . [PMID: 26425884]. 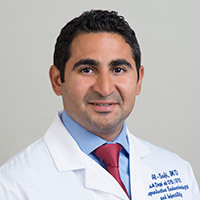 Al-Safi ZA, Edil BH, Post MD, Pearlman NW, Alvero R. Fertility Preservation in a Patient with Benign Multicystic Peritoneal Mesothelioma. J Surg Oncol, 2014; 110(4): 372-4. [PMID: 24861198]. Al-Safi ZA, Santoro N. Menopausal Hormone Therapy and Menopausal Symptoms. Fertil Steril, 2014; 101(4): 905-915. [PMID: 24613533]. Society for Reproductive Investigation, SRI-Pfizer President’s Presenter’s Award, SRI Annual Meeting, 2015. Endocrine Society, Early Career Forum Travel Award, Endocrine Society Annual Meeting, 2015. American Society for Reproductive Medicine Corporate Member Council In-training Travel Grant, ASRM Annual Meeting, 2014.